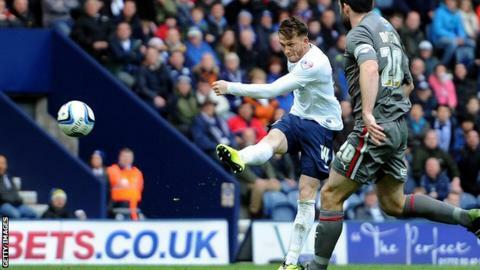 Preston striker Joe Garner says the 25-yard volley that earned North End a 1-1 draw against Rotherham in their League One play-off semi-final on Saturday was one of the best goals of his career. Garner controlled with his chest and flicked the ball over a defender before firing past goalkeeper Adam Collin. It was his 24th goal of a prolific season for the Lilywhites. "I knew as soon as it came off my foot that it was going in," the 26-year-old told BBC Radio Lancashire. "It sat up well and was there to be hit. It's up there with the best I've scored. We needed it. It gave everyone a bit of a lift around the place." Rotherham had led 1-0 at half-time with a goal from Alex Revell, but Garner's outstanding strike ensured the two sides will go into Thursday's second leg on level terms. Millers boss Steve Evans described it as the "goal of the century" and added: "If there is a better goal in the play-offs this year, then I'll wake up a chicken." Preston manager Simon Grayson said: "The way he controlled it, flicked it over the lad and then hit it first time - the keeper didn't have a chance. "It was worthy of winning any game, never mind getting you back into the tie. "You can't ask any more from Joe. He's been fantastic all year and won the player of the year award." Having come from behind to draw the first leg, Garner believes Preston are in a good position to qualify for the final at Wembley on 25 May. "We're strong away from home," said the former Carlisle and Nottingham Forest forward. "We're very confident that we can get a result there and end up where we want to be. "It's all to play for, and with two good sides going at it, it should be a very good game."